"Space is big. You won't believe how vastly, hugely, mind-bogglingly big it is. I mean, you may think it's a long way down the road to the chemists, but that's just peanuts to space". Colin - We've been building telescopes for 400 years, and gradually, they've got bigger and bigger. It has usually been driven by what technology is available. So Galileo started off by using sort of spectacle lenses and a cardboard tube, and we've now gone to building 8 to 10-metre mirrors, which have given us fantastic new views of the universe. But what we found now is, because we've got the technology that has developed to allow segmented mirrors (so we take lots of hexagonal segments and join them together to make a bigger mirror) we're not stuck with the 8-metre size - we can go bigger and bigger. In fact, we're only stuck by the amount of money we've got, basically. So we can build a big telescope, and at one time, we were looking at building a 100-metre diameter one, but now, we've been more sensible. We're talking about building a 42-metre telescope, which is very big. And the big things it does; it gives you much more sensitivity, so it collects so much more light - more light than all the other research telescopes in the world put together. And if you put that together with the fantastic spatial resolution, (in other words, the detail that you can see with this telescope) you can really do very, very faint objects, like the early universe, like the early galaxies, and understand them, and to do astrophysics, and find out how they're rotating, and merging, and all the sort of thing. And you can also look at nearby things, or relatively nearby things, like planets surrounding stars. Because you can do that, you can actually understand much more about them, you can look at their orbits. Potentially you can even look at the colours, and we might even find some that are similar to the Earth. So that's why we want a bigger telescope, to do all these things that we can't do now. Ben - So what are the engineering challenges of building something this big? Colin - Well, it's very much bigger than we've done before, as I've just said. The telescope itself is made up of 984 individual mirror segments - each of which is 1.4 metres across, so each of them is quite big, and you've got to keep them together in a nice, perfect shape as the telescope moves around the sky, and as gravity varies because of that. And you've got to keep them aligned to something like 10 nanometres, which is very, very challenging. So you've got to have lots of instrumentation, lots of control systems to keep all that working properly, and that's got to work very reliably all through the night, and year after year. On top of that, we've also got to deal with the atmosphere. In some ways, our life is quite difficult with ground-based telescopes. We've not only got to deal with gravity varying, but we've also got to deal with the atmosphere varying. If you build a space telescope, you don't have to deal with either of those things, but on the other hand, you do have to launch the thing, which is expensive and time consuming. So, what we think we can do on the ground now is, by using something called adaptive optics, we can get over the limitations of the atmosphere. The atmosphere moves around and blurs the images, but we can measure the amount of blurring by looking at a natural star, and measuring the wavefront from that star, or we can put an artificial star about 90 kilometres up in the sky by using a laser, and we can measure the wavefront from that. If it's distorted, we measure that distortion, and then we apply the opposite of that, and then we've got effectively, a perfect image. This means we can get fantastic image quality, which you couldn't do in space, because you couldn't ever launch a big enough telescope. Ben - We've had segmented mirrors, these hexagonal, individual mirrors, for a while. Can we just scale up the technology used there, or does the sheer size of this present a whole, unique set of challenges? Colin - It's pretty much the same technology - the big problem is just the scale of it really. 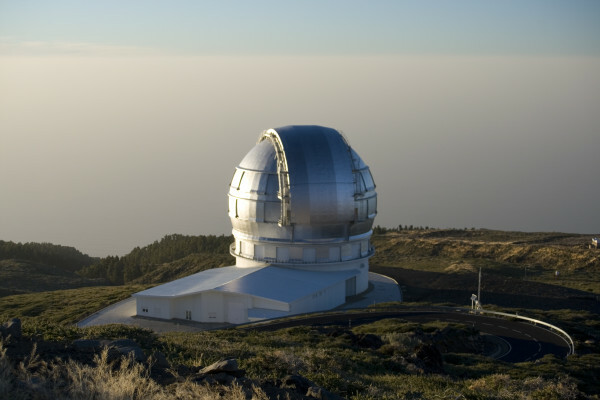 The current biggest telescopes in the world with segmented mirrors are the Kecks and the GTC in the Canary Islands. They've got 36 segments, and making one of those segments, at the moment, takes about six months. So it's actually the manufacturing process - if you multiply six months by 984, you'll realise that we are not going to be building this telescope in anybody's lifetime. So we've got to make one of these mirrors, basically one a day. So we need new technology to do that, and we've got new technology, actually in the UK. There's a consortium of organizations working in North Wales, at the OpTIC Technium, that are making prototypes for this telescope now, and they've got some new technology that allows us to do it much quicker, so that the telescope is possible. Ben - Do we also have to find new materials to get over some of these challenges? I assume that these mirrors aren't the sort of mirrors I have at home - a sheet of glass with a very thin film of aluminium on the back? Colin - Well strangely enough, they are pretty much. It's better glass than you've got on your mirror in your bathroom - it's low expansion glass, it's quite tricky to manufacture, but it's the same thing that people have been using for about 150 years really. It's a glass-ceramic with a coating of generally silver these days (as opposed to aluminium). And we have looked at new technologies, new materials like silicon carbide compounds and composites, and even carbon fibre composites. They do give you some advantages: They're usually a good deal lighter which means the rest of the structure becomes a lot lighter as well. But the general feeling is that they're not really there yet, and the conventional glass-ceramic, coated with aluminium or silver, held on a steel structure, is actually the best thing to do. Ben - Can we apply any of the lessons that we've learned through this, to more mundane things? Colin - We certainly can and we already are doing. The adaptive optics technology that we use to correct the images from the sky, can also be used to correct images used for looking into your eyes. So you can use adaptive optics to actually improve the quality of an image of the retina, and look at individual rods and cones, look at the individual blood vessels, and actually measure blood flow in those blood vessels. That's the only way you can do that of course, without cutting somebody open. That could be very important in terms of diagnoses of diseases like diabetic retinopathy. If you go to the opposite extreme, the technology we're learning in order to make mirrors at a reasonable cost, and a reasonable speed, we can use for laser fusion in the future. Already, people are building laser fusion systems in order to get green energy - You know, basically, we'll be reproducing what happens on the sun. There's no radioactivity, there's no carbon emission, and you get almost an infinite supply of energy. If this works, this could save the planet, and we can do this using the technology we're developing for astronomy. So that's pretty good, if you ask me. Ben - Colin Cunningham, explaining how technology developed for star-gazing may help to see inside your eyes, or provide ways to generate clean electricity, as well of course, as seeing further into space. Diana - So, do astronomers get telescope envy? Ben - Well, I think that many of them would claim that it's not how big it is, but it's where you put it that counts. For example, there are only a few sites on earth which are good enough to detect much in the way of infrared radiation from space. Our atmosphere absorbs too much, so you either have to get above much of the atmosphere, like in the Atacama Desert in Chile, or even out into orbit. So where you put it is really is more important than size. Next Sediba - a newly discovered ancestor?